Even after a couple of days in Namibia, we are still confused by the time difference and wake early bursting to go to the toilet at 5am. It’s not even light yet, but half the camp is already up lighting their fires and packing up. I return from my cold dash to the toilet block and leap into our tent seeking comfort in my warm sleeping bag, trying desperately to catch another couple of hours sleep, at least until the sun has risen. It’s going to be a short day today. 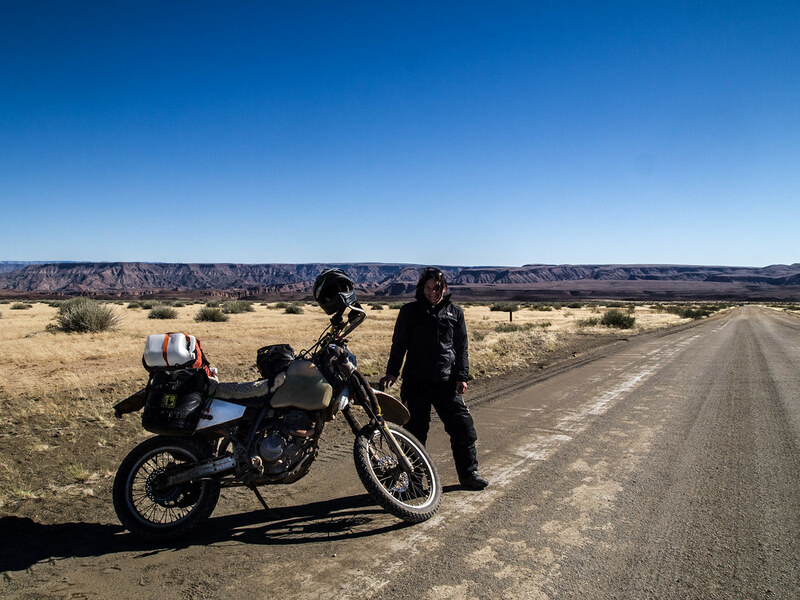 We are planning on riding to see the mighty Fish River Canyon, which is a mere 70 kilometers away on yet another dirt road and then onwards to camp at Cañon Roadhouse a few kilometers past the look out. The dirt roads here in Namibia are fantastic! They are wide, flat with some sandy spots. You can easily travel around 80 kilometers per hour without too much trouble. But as we experienced just two days ago, you always have to be prepared for surprise sandy bowel or a massive rock a grader managed turn up and then half cover. Today the roads were amazing, we flew along the road towards Fish River Canyon, I’m following behind Mike who is several motorcycle lengths ahead of me. The road makes a slight turn and each side of the road opens up to a large plain. I feel the wind hit my front wheel and it starts to drift outside the one of the wheel ruts I’m following diligently. My right hand pushes the right side of the handlebar hard forward trying to keep the wheel turned slightly upwind. I position body so my bottom rests half off the seat. I let my leg flop open to try and put as much weight as I need upwind to stop from weaving all over the road. But every now and then a gust of wind pushes me over and I start to drift once again. In situations like this, it’s easy to just let yourself open up the throttle and go as fast as possible, so without knowing it, you end up increasing your speed all the time. You have to force yourself to remember, that it’s best to keep it consistent and leave some speed in reserve for when you are pushed unexpectedly into a dangerous spot on the road. 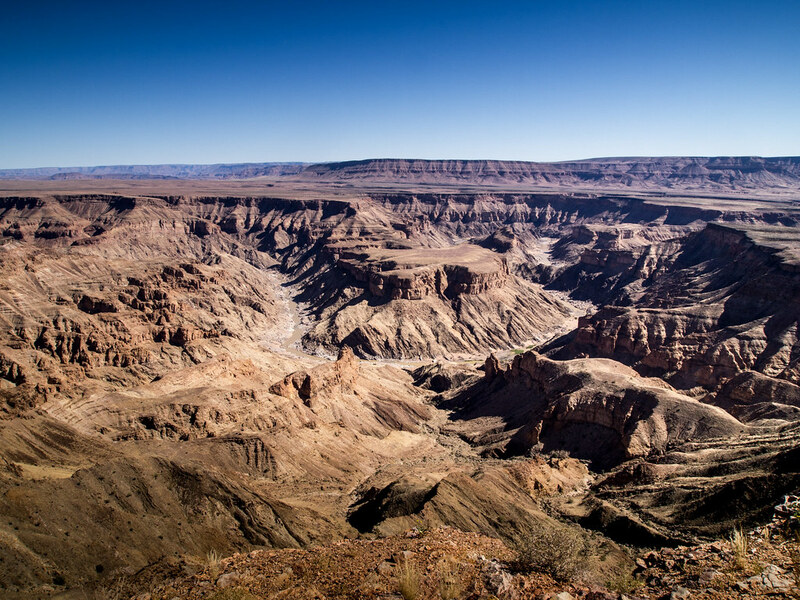 We turn right off the main road and take a smaller dirt road towards Fish River Canyon. Now we are riding directly into the wind. I’m now worried I will end up using all my petrol just to cut through the wind. I pull my body down as close to the bike as possible and tilt my head up to steer straight ahead of me. To avoid being sand blasted in the face by the Mike’s bike, I pull onto the opposite side of the road to him and we ride parallel to each other. Every now and then we take a glimpse at each other. Mike signs to me that he loves me and my heart melts. It’s so nice to share this experience with someone so special. The road changes again, and we head up over a small rise and pass a road sign with an exclamation mark and the words WIND written below. As we near the top of the rise, I can actually feel the wind dropping and the temperature warming up. 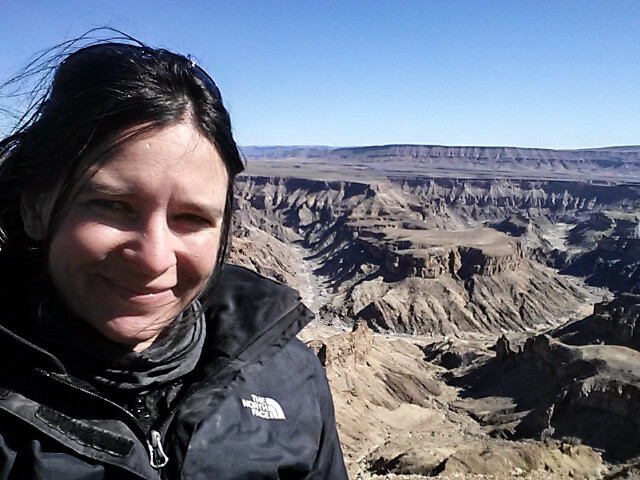 Just ten kilometers shy of Fish River Canyon, we have to stop at the park gates and get our passes. They cost a fortune (R90, approx. $9USD, each including vehicle fees) considering, we will only be out there for an hour maximally. We drive out to the main viewing platform and sit on one of the many empty seats and just stare in wonder. Wow… it truly takes your breath away. Mike and I get encouraged and discuss the possibility of doing the five day hike between Fish River Canyon (Hobas) and Ai-Ais. But before we can venture out on something like that, we would have to find some proper hiking bags since we only have a couple of day packs and all our motorcycling gear! We leave Fish River Canyon behind and continue our trip north to a little outback station called Cañon Roadhouse for an early end to our day. Cañon Roadhouse is quite unique as it is full of old vintage cars. 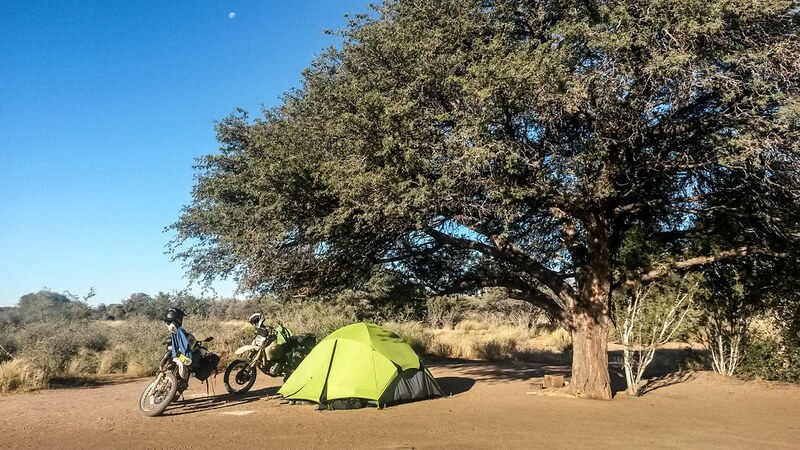 The facilities are amazing and we enjoy the piece and quiet of the place, so we decided to spend two nights enjoying our camp spot under a large tree and let our internal body clock get used to the new time zone. Wonderful adventure and I can hear the pleasure of being back on your bikes, in your words.